Bhutan has beautiful Hiking Trails of a few hours to even a whole day. In case you want to walk and experience Bhutan on foot,but cannot take up the treks or do not like camping the night out, then you can always do a day’s hike. The possibilities of Day hikes range from a few hours to a day’s walk is plenty in Bhutan.The Hiking trails are mostly very comfortable and passes through forested areas with a lot of wilderness around, many chortens(small stupas), Monasteries, clear beautiful lakes, and may even discover your path through a Bhutanese village. Depending on which places you will be touring while in Bhutan,we will adjust and insert the Hikes in your Tour Itinerary. Do let us know what you prefer,Trek or Hikes and we will customize accordingly to suit your want. WALKING: If you prefer walking for short distances,mention this is your inquiry sent to Bhutan Jewel Travel and we will arrange this into your Travel Program. The Kilu Nunnery Hike: Its a walk of little over one hour. The Kilu Nunnery over looks the Paro Valley and is one of the oldest nunnery in Bhutan. It is important as it has been a medidation center for many centuries and house the statues of the Guru Rinpoche and Chenrizig (Avalokiteswara). There is optional walk to Kilu Goenpa whereby one can hike to this monastery from the road en route to the Chelela Pass OR one can drive till Chelela Pass and then takea hike to this monastery. The latter hike being more longer than the former hike. Zuri Dzong Hike : This old Dzong, an ancient fortress dates back to 1352 and is a hike which gives a spectacular view of the Paro Valley and the Paro International airport. It is a hike which takes about 2 hours starting at the Paro Taa Dzong or the National Museum of Bhutan and ends above a resort above the airport. Hikers enjoy a peaceful time, a rest now and then to soak the view around. There is a cave too believed to have been used by the Buddha to meditate but this is just rumors and we cannot validate this rumor. 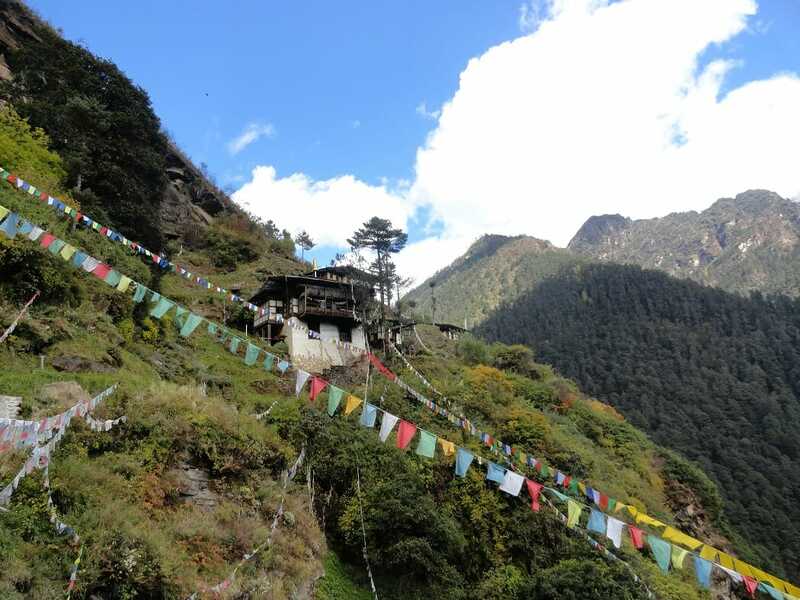 DraKarpo Hike : This hike to is a Cave where the Guru Rimpoche meditated in the 8th Century. This cave is different from the others as the Guru had actually broken the rocks here to make the cave for his meditation. The Bhutanese from all over Bhutan come here and try and do 108 rounds of the cliff that holds this cave. one round of this entire cliff takes about an hour. Lungtsutse Hike: Its takes around 4-5 hours round trip depending on your walking pace. Its a lovely temple situated above the Dochula Stupas. The hike starts from the Dochula Parking Area. The Hike trail is a very comfortable one with very gradual ascend to the Temple. Upon reaching the temple,you will view the spectacular Himalayan Range of Mountains,and the low lying valleys of Punakha and Wangdue. Tango and Cheri Hike-THIMPHU: This is a hike in Thimphu and is a whole one day hike. Most monks and Gurus meditate in these Monasteries. Tango is a Buddhist Institute where monks,scholars and high lama graduate with a Degree in Buddhist Studies. Khamsum Yuley Temple Hike: This temple was made by Bhutan’s Queen Mother for the present Fifth King of Bhutan,for his long life and good health. This temple hike will take half a day and is beautifully perched on a hill top. The architecture is fully Bhutanese and only Bhutanese Artisans have worked their magic on this uniquely beautiful temple. Rukubji Hike: Rukubji Hike/walk is a beautiful walk through the remote Rukubji Village. The Drapham Dzong Hike. This is an ancient Historical and Archaeological Site in Bhutan dating back between 1550 to 1700 century. Just about 5 years back this site was discovered by accident by some villagers.